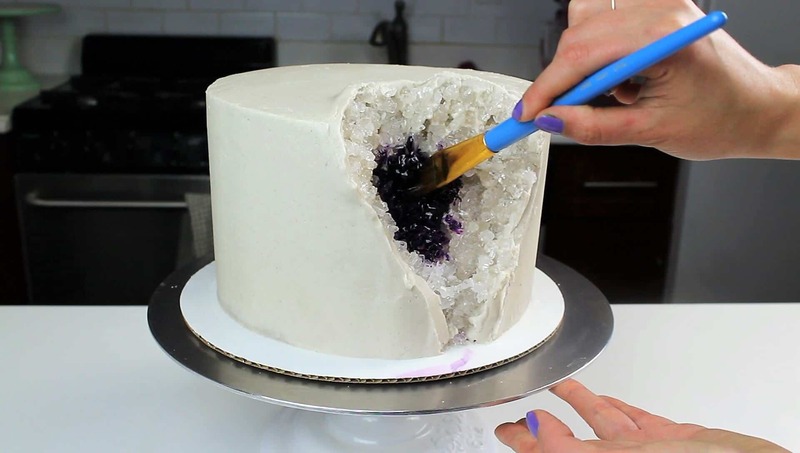 I finally hoped on the geode cake band wagon this weekend, and found that it is WAY easier to make a geode cake than I thought! All you need is a frosted cake, some white/clear rock candy, gel food coloring, and a little vodka! I was inspired by an amazing geode wedding cake made by Intricate Icings Cake Design, and also added a gold boarder with edible gold paint. I modified the design to make it a bit more approachable for all of us home bakers! I used my favorite vanilla layer cake recipe (bakes perfectly flat), which I colored purple with gel food coloring. I baked four, eight-inch round cake layers using 1. batch of cake batter, and frosted the cake layers with american buttercream (I made 1.5 batches of my frosting recipe). Once stacked, I applied a thin crumb coat around the cake, and trimmed a triangle from one side of the cake. I then covered the exposed area with frosting, and let the cake chill in the freezer for about 5 minutes, until the crumb coat is firm to the touch. Apply a second layer of frosting, and smooth using a bench scrapper. 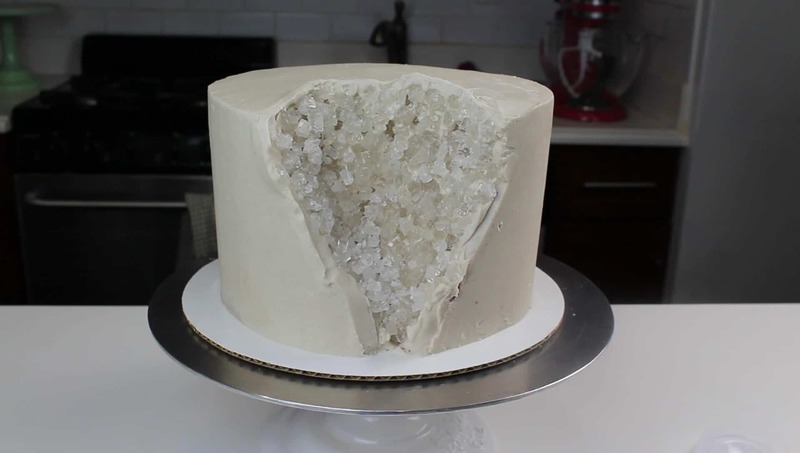 Gently press crushed rock candy into the cut area of the cake. I started with the larger chunks of candy, then filled in with smaller bits of candy. Mix together a few drops of vodka and large squeeze of purple gel food coloring. Using a sterile paint brush, gently dab the mixture into the center of the candy area. Rinse off and dry your paint brush, and add some additional vodka into the gel food coloring to dilute the mixture. Brush around the dark purple center, gradually spreading the lighter purple liquid out towards the edge of the candy covered area. Leave the rock candy around the edge uncolored. I also painted the edge of the candy area with a boarder of edible gold paint. And that’s it! It’s that easy!!! If would also be fun to use a grey buttercream (or even an oreo buttercream), to make the cake look more like a rock. My son would like a rock cake for his birthday. Is there something I could use in place of the vodka when painting the rock? sure, you can use lemon juice!! Why vodka or lemon juice? What is the purpose? it thins out the gel food coloring so it’s easier to paint with, and it helps the gel food coloring dry faster! My daughter desperately wants to make this for her birthday? Where do you find such big chunks of rock candy? I’ve only seen it on a stick or on a string. would this work the same if instead of vodka i use something different ? Thank you for the tutorial! I’m making my own rock candy, so I will just color it at that time. You made this look very approachable! Hi Chelsweets! Can I put the whole cake in the refrigerator once it’s finished, or will the buttercream get weird? You definitely can, I do that all the time! just be sure to let it slowly warm to room temp the next day, to minimize the risk of condensation! The buttercream will crust as it’s exposed to the air, but it doesn’t change the taste at all! I know this question has been asked but where did you purchase the strings of rock candy for this cake? 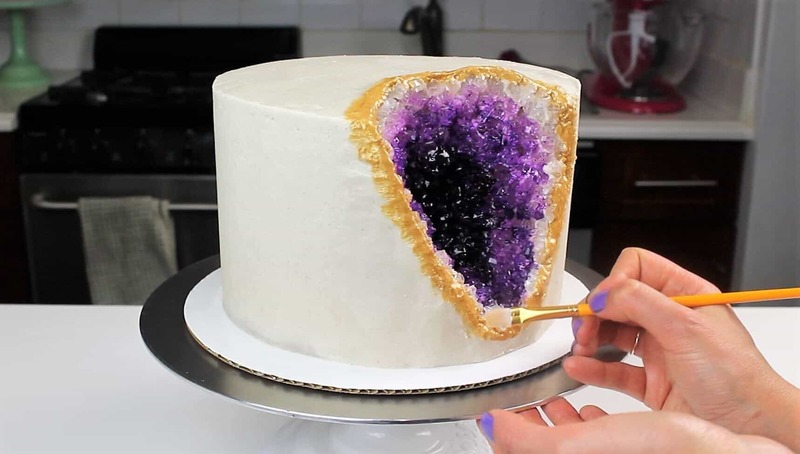 I am getting married with a geode cake but the baker can’t find the right rock candy to use.. I ordered mine on amazon! There are a ton of different vendors, and it’s all pretty much the same product just different quantities. How much rock candy did you need for this cake? i probably used about 12 rock candy sticks! but it can vary depending on how large of a cut you make, and how big your cake is! like Italian cream or carrot cake with cream cheese frosting instead of butter cream? Any advice is greatly appreciated ? it should! I do find cream cheese frosting is harder to smooth though! Thanks for sharing this! I want to make one for my daughter’s 30th! How thick are each of the layers? You said they are 8″ but they look much flatter. Thanks! They are 8 inches across, and about 1 inch tall! Yes, lemon extract is a great alternative! Hi! What is your favorite brand of edible gold paint to use? Hi, a question on cake and buttercream recipe. 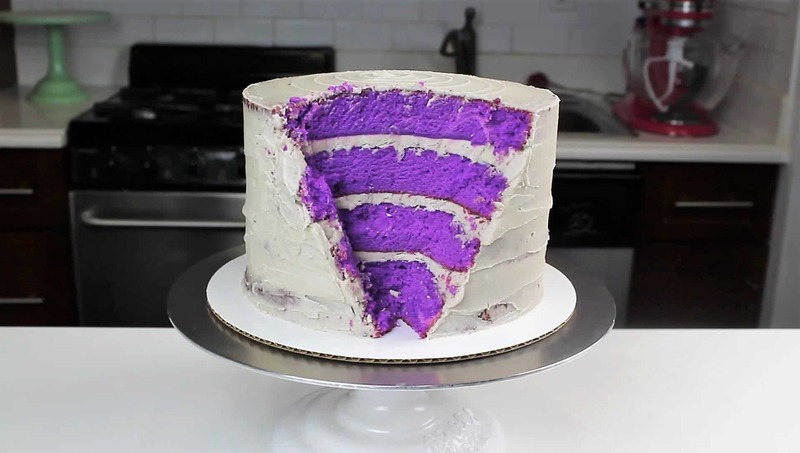 “I used my favorite vanilla layer cake recipe (bakes perfectly flat), which I colored purple with gel food coloring. Did you take 7inch cake recipe and took 1.5 times? Also 1.5 times recipe from you 7” buttercream recipe? I make one batch of cake layers to make four, eight inch layers! My layer cake recipe can be used to make seven or eight inch cake layers, it just makes less thick layers when they’re 8 inches across! I didn’t want this cake to be too tall, so I made the layers 8 inches. The second line you included means I made 1.5 batches of buttercream frosting! I updated the wording to make it more clear that I’m referring to the frosting. Hope that helps, I’m so sorry for any confusion ?? That helps. Could you tell me how tall was the cake when all done?